The recent Journées du Patrimoine (heritage days) event gave me the opportunity to explore two places usually closed to the public - both of which are linked to Napoléon III. The first, the Cité Napoléon is the better-known of the two. 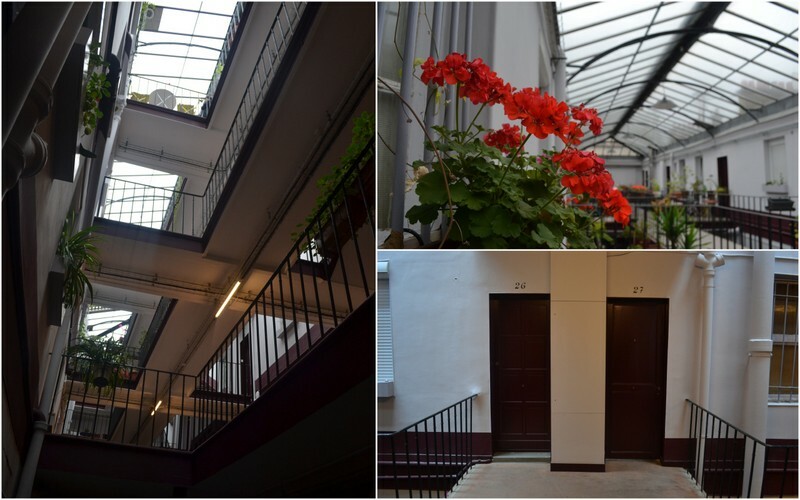 Situated on the Rue Rochechouart in the 9th arrondissement, it was the first attempt to create decent housing for the working classes in Paris. The Cité was opened in 1851, just as the Second Republic morphed into the Second Empire (and Louis-Napoléon Bonaparte from 1st President of France to 2nd Emperor of the French.) Although a significant development of over 200 apartments, it was originally planned to be much larger. The ambitions didn't end there though. The housing complex was supposed to be the first of a series of similar constructions across the capital that would house (and control) the working classes. No others were ever built. The connection to Napoléon III does not relate to the era in which it was built, but rather to the fact that the emperor himself was the driving force behind its construction. Napoléon III took a genuine interest in the conditions of the poor, but from a completely paternalistic perspective. Concerned particularly with their living conditions - and influenced by early British pioneers such as Henry Roberts and the phalanstères of Charles Fourier - he believed that through careful management of their habitations, the poor could be lead away from poverty. Louis-Napoléon himself donated money to get the project rolling, and managed to persuade a number of other individuals and institutions to invest. The chosen site stood alongside a gas factory, in a district in sore need of housing for workers. In addition to the apartments, space was also found for communal facilities including a laundry, a crèche and workshops, and throughout the development importance was given to the circulation of light and air. In addition to this, rents were set at comparitively low rates - and yet still the development was not a success. What were the reasons behind this failure? Fundamentally, the flop seems to stem from a profound misunderstanding of the desires of the working classes in Paris. Although affordable, the target workers had no desire to live in a building that looked like a military barracks, and was controlled by people who wished to organise all elements of their lives. Perhaps most off-putting of all was the fact that the building only had one entrance, and that this entrance was firmly shut at 10pm each night! Most of the construction was made up of small 1 and 2 bedroom apartments, but there were a number of bigger apartments geared towards larger families. However, these were too expensive for workers in the neighbourhood, and it would have been impossible to imagine the middle classes moving into such a development. The majority of these apartments therefore remained empty for long periods. Somewhat ironically, the building seems to be very much peopled by the middle classes today. The complex, made up of four seperate buildings situated around a large garden courtyard (where the original fountain is still visible but no longer working), is also an obligatory stop for all architecture students in Paris. This is mostly due to the interesting layout of the largest building which fronts onto the Rue Rochechouart. The building is laid out into four 'streets' placed one on top of the other. These are connected by a series of staircases, and topped by a fantastic glass roof. The ensemble is certainly light and airy, but it is also still possible to see the drawbacks that initially kept people away, namely a sensation of being observed. From the corridors you can see right inside the apartments, and indeed it is almost possible to see all parts of the building from any particular spot. It is easy to imagine being watched by a disapproving paternal presence from down below! The Cité Napoléon, 58-60 rue de Rochechouart, M° Anvers. Although visits are not generally permitted, it is normally possible to enter the building during the week. I am so happy to find your blog. It will most definitely improve my knowledge and appreciation of Paris, which we plan to visit in May, 2015. While listening to "Paris Reborn" an Audible.com book, the Cite de Napolean was described by S. Kirkland. I looked for it on Google maps, but could not spell Rue Rouchechouart. Finding it in Wikipedia, I also found your Invisible Paris. You description matched that of Stephanie Kirkland, which gave me much confidence in your work. What is more, your photo tour of these apartments was a treat and vastly superior to Streetview. I was much gratified to learn the specific address of the Cite de Napolean from your blog. Thanks for your at tension the detail. Thanks alot for this . This building is well worth visiting .